This series was aimed to analyze feasibility, safety and postoperative quality of life of trans-abdominal pre-peritoneal repair in incarcerated hernia; the rationale was a safe hernia reduction, more accurate abdomen exploration, diagnosis and treatment of contralateral unknown hernia. With a minimum follow-up of 30 months, 20 urgent incarcerated inguinal hernia patients were submitted to TAPP. Signs of strangulation, peritonitis and major comorbidity were exclusion criteria. Feasibility and safety were evaluated by ability to hernia reduction, conversion rate, operative time, perioperative mortality, morbidity, hospital stay, prosthesis infection and recurrence. Finally, quality of life was assessed by acute and chronic pain score, recovery of normal activities, return to work and patients’ satisfaction survey. Under vision sac reduction was always achieved, incision of internal ring during the reduction manoeuvre was necessary in 40% of pts, intraoperative complications, conversions or perioperative mortality were not observed. In one case (5%) partial omentectomy was necessary. Contralateral hernia was diagnosed and repaired in 20%. Median operative time was 81.3 min, postoperative minor complications were recorded in 5 patients (25%), median in hospital stay was 2 days. After a median follow-up of 39 months, 1 patient recurred (5%). Acute pain, was scored 3 as median value (range 1–5), only one patient scored 2 as chronic pain during follow-up. 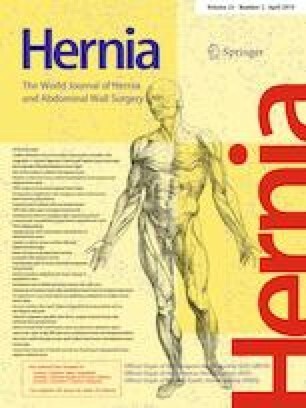 Laparoscopic approach for incarcerated inguinal hernia repair is not the standard treatment. In our experience, with the limit of a single-surgeon series, selected patients showed satisfactory results in terms of feasibility, safety, postoperative quality of life and patients’ satisfaction were observed. Few series about this topic were published. More prospective trials are needed. Approval from the institution review board was not required for this study. This article does not contain any studies with animal performed by any of the authors. All human patients gave us a written informed consent.